Apartamento 7º distrito elegante y contemporáneo cerca del Hotel Matignon. Acogedor apartamento en el distrito 7, con decoración artística y contemporánea, ubicado en la orilla izquierda en el distrito de las embajadas, que es muy seguro día y noche. Ideal para unas vacaciones en familia o para un viaje de negocios. 3 líneas de metro (10,12,13) ​​y líneas de autobús (82,87,92). Cerca de una estación de alquiler de coches por la ciudad de París (Autolib '). Este apartamento de 4 habitaciones tiene 2 dormitorios con ropa de cama nueva y 2 cuartos de ducha. - Dormitorio principal con 1 cama matrimonial y baño privado..
- Dormitorio de invitados con una cama doble. - Biblioteca de salón con escritorio, wi-fi. - Comedor, con una cama individual para una quinta persona. - Cocina con ventana en un bonito patio con árboles independientes. Está equipado con una placa de inducción, campana extractora, lavavajillas y lavadora. Cerca del edificio, pequeñas tiendas y buenos restaurantes. El 'Bon Marché' a 5 minutos a pie tiene un gran radio de delicatessen donde los gourmets y gourmets pueden abastecerse. Cerca de un gran espacio abierto por la noche. Posibilidad de alquilar en estancias cortas y largas. Póngase en contacto con el propietario directamente por correo o teléfono en francés, inglés o italiano. Idealmente situado en el famoso lado izquierdo de París. Entre las embajadas y Matignon, el dije es muy seguro día y noche. A 10 minutos a pie del museo de Orsay y de camino al museo Rodin. A 15 minutos de la torre Eiffel, al otro lado, y a 10 minutos del 'Quartier Latin' y Montparnasse. A unos pasos del 'Quartier St Germain', encontrará salas de decoración y moda. Una gran farmacia abierta hasta tarde. El piso es muy cómodo con 2 dormitorios y 2 baños pequeños (2 duchas grandes y baños). El segundo dormitorio con vista al encantador patio tiene una cama doble. El salón es acogedor en un estilo moderno, diseño contemporáneo, hay un escritorio con wi-fi. El comedor con biblioteca tiene una cama individual para 5 personas. La cocina con una hermosa vista sobre el auténtico patio pavimentado de piedras de París. En esa cocina encontrará una nueva máquina porque se acaba de cambiar (cocina de inducción, lavadora). Apartamento perfecto para vacaciones de cultura familiar! Paso profesional de oro. Te quedas para una estancia corta (mínimo 3 noches) o larga estancia. Póngase en contacto con la persona que alquila por correo o por teléfono. Las camas estarán listas. Si necesitas a alguien para la mayordomía es posible. Debido a su singular ubicación facilita unas vacaciones en familia culturales y viajes de negocios. Los grandes salones de Villepinte y Porte de Versailles son fácilmente accesibles. Great spot for a get away weekend. This apartment is wonderful, and in an amazing location! We are a family of five, and we were looking for an apartment in the 7th arrondissement with at least two bedrooms and two bathrooms. Making arrangements with Pascale was pretty easy. We arrived and were greeted by Lucinda with two keys. The apartment is an easy walk to so may great landmarks! We walked to Le Bon Marche, the Rodin, d'Orsay and the Louvre museums. There were lots of places to eat within walking distance. WiFi worked better in one end of the apartment. Our daughters shared a double bed in one bedroom, and we had the master. Our son slept in the room off the living room. The only thing that was weird is the bathroom in the master bedroom is separated by a curtain. Not much in the way of privacy. We had to buy toilet paper. The shower in the master bedroom was strong and fine. The one in the other bath was a handheld with no "stand." The sheets and towels were just okay. The beds were serviceable but not too comfortable. The pillows weren't great. I would have appreciated a few extra. I gather the the apartment is the owner's mother's, and she paints. I enjoyed the artwork all over. The electric kettle was rusty, so we didn't use it. The washing machine/dryer was a great addition and we were happy to do laundry halfway through our trip. Again, the location can't be beat. I would definitely stay here again. A wonderful apartment in a great location! We really enjoyed our stay at this apartment. The location was fantastic - close enough for us to walk everywhere. The decor was very charming and oh so Paris. The kitchen is very well equipped and Pascale is awesome. I would absolutely recommend this apartment. There is a great bakery around the corner (on Babylon) where we get great fresh breakfast at a great price. A thing to note is that the metro is about 15-20 min walk from this place - not a big deal. Also, would have loved stronger/better wifi coverage - other than that the apartment is awesome! Charming older apartment. Great location. Good use of space. Very nice conveniently located flat. We were warmly met by Lucinda and although she speaks only a little English, she was very helpful and able to clearly communicate all that we needed to know. Easy walk to Museum De Orsay and other sights. Great little bakery right around the corner. Flat is beautifully decorated and comfortable. The Internet doesn’t work well, but we weren’t in France to stay in the flat on our phones. Use Wi-Fi elsewhere to schedule any tours or purchase advance tickets. Lucinda’s daughter Madine spoke excellent English and helped to explain some information regarding the bus routes. This was the perfect place for our family of 4 (adults) to stay! 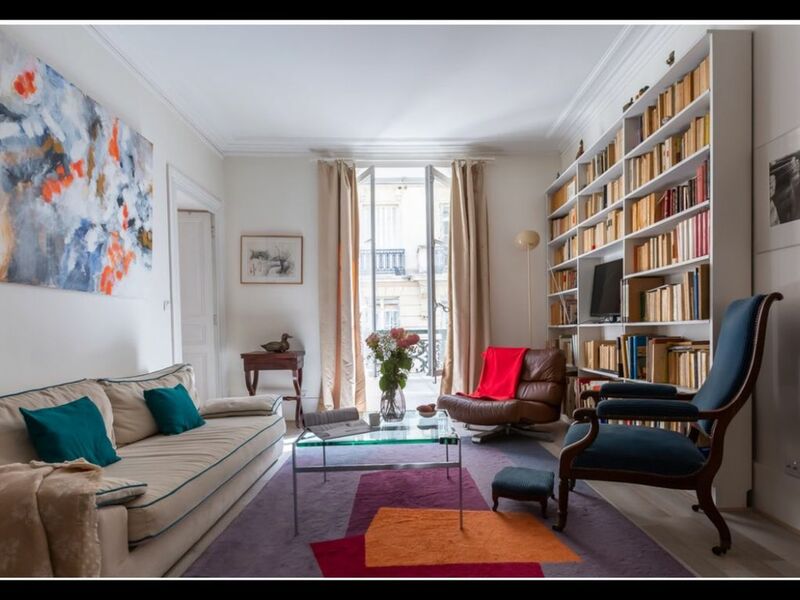 Cozy, friendly stay in Paris 7eme. We really enjoyed our time in this cozy flat. The owner and concierge were very responsive. Everything was clean and the place was well appointed. A few insignificant issues... The second shower hardware came out of the wall when I was in there, which was alarming at the time and the coffee maker stubbornly chugged along, but was awkward. All in all, I would recommend this place. It's well located and very pleasant. You won't go wrong. Barrio de las embajadas, seguro altamente día y noche detrás de Matignon. A 10 minutos a pie! el Barrio Latino, la Torre Eiffel y el Musée d'Orsay, Montparnasse. Cerca de 3 estaciones de metro cercanas paradas de autobús que enmeneront en lugares estratégicos culturales directamente.